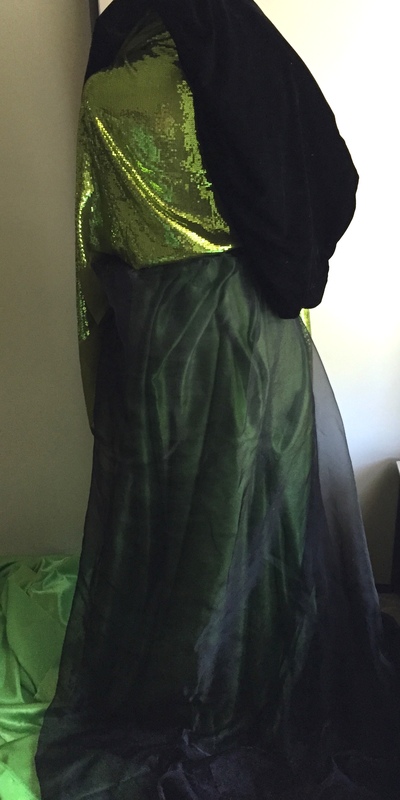 I’ve made some progress on the Lady Tremaine costume by finishing the black velvet underskirt. 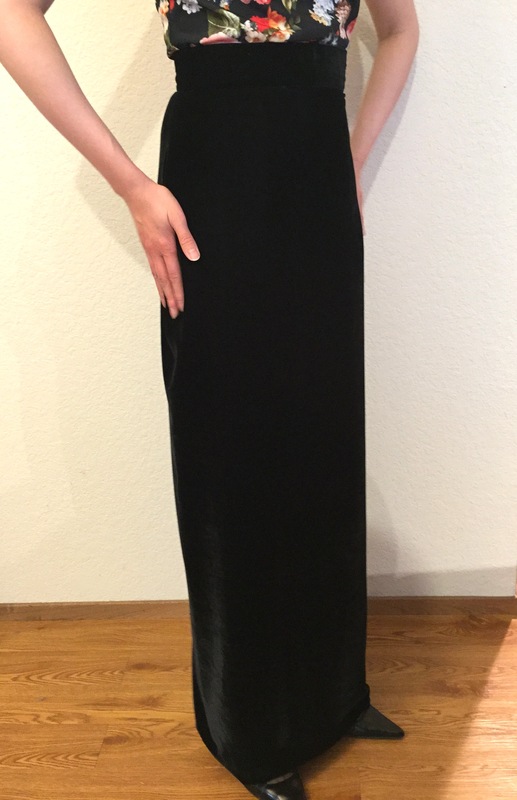 It is just a simple column skirt, so it didn’t require a pattern. (You can find basic drafting instructions here). I started sewing the green and black overskirt, but have been stalled a few times by a comedy of errors (more on that below). I have the overskirt cut out and partially sewn. 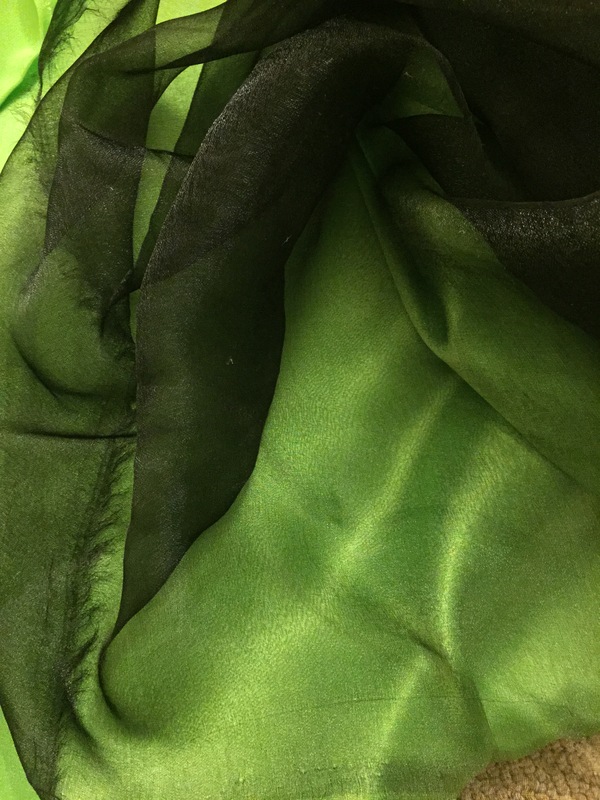 I am using 8 yards of green satin and 10 yards of black organza. I am putting two layers of organza over the satin, since one layer is too sheer. 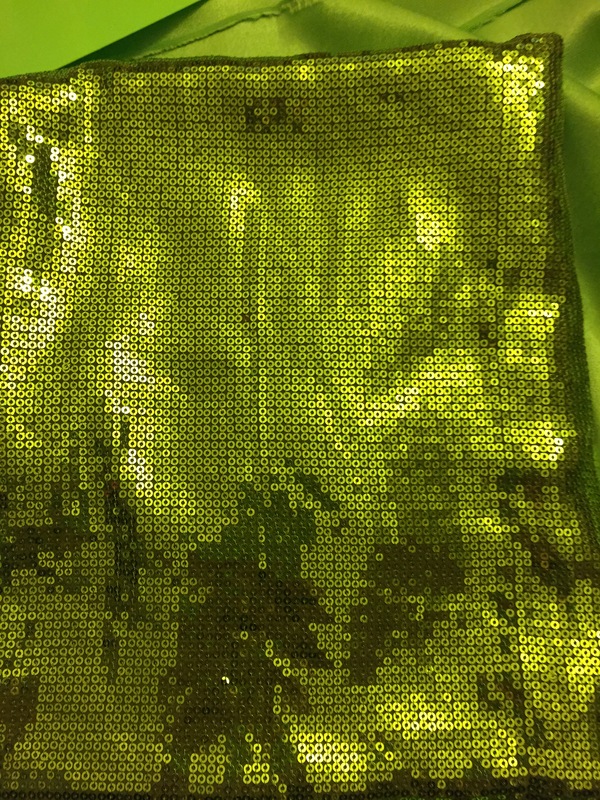 Here is the crazy apple green sequined fabric I’m using for the bodice! I am almost afraid to cut into it. 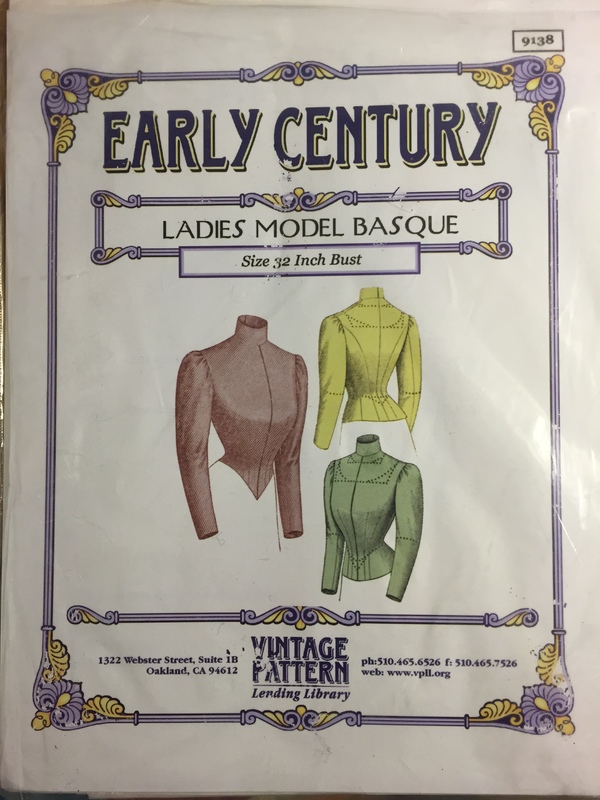 I received the Vintage Pattern Lending Library basque pattern I am going to adapt for the bodice. I threw everything on my dress form to see how the colors work together but I’m missing the supplies for the floral appliques. I’ve had a few sewing hiccups recently that conspired to prevent progress. Some problems have been resolved, and some are ongoing. The foot pedal on my vintage sewing machine started crackling so I had to stop using it. I found and purchased a replacement, and now I no longer hear scary electric noises! My fabric wasn’t feeding correctly and the thread kept snapping, and eventually I realized the feed dogs had collapsed. I opened the machine and tightened things up the other night, and now it’s running smoothly again. I planned to use iron-on flocking for the floral appliques on the skirt. I thought it was a great way to save time, and avoid the fraying that would come from velvet. Unfortunately, the “chartreuse” flocking I ordered turned out to be a very bright and unflattering neon green, so I had to scrap that idea. I settled on using wool felt for the appliques but decided to ask for swatches this time to make sure I could find the right color. It’s been 2 weeks and I haven’t received them. The shop says they were shipped, but if so I fear they have been lost. Meanwhile, I went on the hunt for very thin black double-sided fusible interfacing by the yard to apply the wool to the sheer organza. It was easy to find single-sided, or pre-cut sheets, but not something that fit all my criteria. I finally found and ordered some, but the shop later emailed me to say they only had part of my order in stock, and asked if they could send me white instead of black! Now I will have to make a second order somewhere else and pay for shipping again. It would have been nice to avoid some of these problems by buying in person, but I am looking for very specific supplies that aren’t always available locally. Plus I work full time and have a toddler so shopping online is blessing (and just plain fun). I decided to add some body to the hem of the green layer of overskirt by adding in horsehair braid. I did find that at a nearby shop, but they had 6 inch instead of 3 inch, which cost more per yard than the satin it is going to hide inside, but the skirt won’t look right without it. This project keeps accumulating miscellaneous expenses, but I am still quite excited and hope it will be worth it in the end! Read my previous post with my costume analysis here. Damn you’ve done an amazing job at finding materials!!! It’s so awesome to see your fabrics together; it’s really going to be perfect! Thank you for the vote of confidence! I can’t wait to see all your fabrics together too! “Love,” Stepmother. If your felt doesn’t arrive, have you considered getting some fabric paint, diluting it with water, and painting it over the neon green flocking to get a more muted color? Since flocking is relatively short-pile the liquid shouldn’t affect the texture too much, and this way you can select the precise color you want. Thank you for the suggestion! I’ll keep that in mind for the future, but I don’t have a particularly steady hand, so I’m afraid of painting the flocked flowers and getting paint on the organza. I’m hoping the felt will save me some time! Oooh, the green sequins are an excellent find. Underskirt looks nice. Thanks Kim! It look a while to find the sequins, but it wouldn’t be the same without them.